The Elliott Waves Theory consists of different cycles of various degrees that complement each other and defines the way a currency pair moves. While Elliott based the original theory on the way the stock market moved, it works on any financial product. To know how to trade with Elliott, you must understand the logical process behind the theory. While I'm strictly trading Price Action, the Elliott way of looking at markets help understanding where price is and where it will go next. Again- this is done solely for educational purposes and not to recommend a trading strategy. 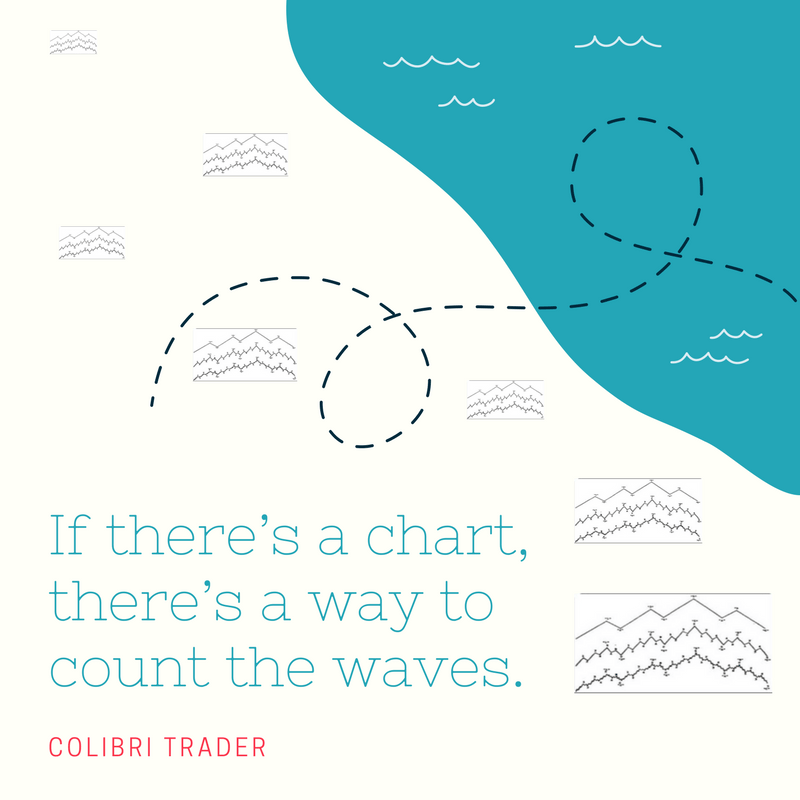 If there's a chart, there's a way to count the waves. However, there's a catch! Traders need historical data. Before counting waves with the Elliott Waves Theory, make sure you get your hands on as much historical data as you can. Also, make sure the data is coming from a reliable source. Think of it for a second. Just open a chart on any currency pair you want, on any broker. Then, go on the monthly time frame. Look at the data offered for the most popular pairs. Take the GBPUSD for example. The data usually goes back to the late 90's. What does this mean? The Great Britain Pound (GBP) didn't exist earlier? Or the U.S. Dollar? Of course, they did. Only, the broker doesn't show the data. Now, there are various reasons for this. Some may be legitimate, some not. In the end, it doesn't really matter. What matters, is for traders to find that data before counting impulsive or corrective waves with Elliott. The only way to know how to trade with Elliott is to know where the market is. Only historical data gives you access to super-cycles, as defined by Elliott. That is why I have chosen to trade with one partner that I can trust. An Elliott Waves cycle consists of an impulsive and a corrective move. 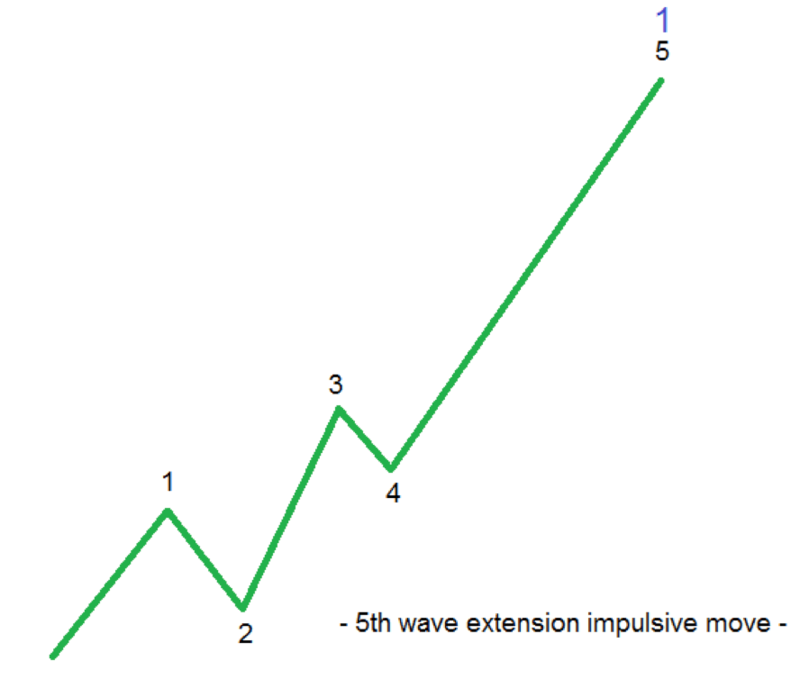 An impulsive wave is a five-wave structure. Moreover, Elliott used numbers to show the impulsive activity. 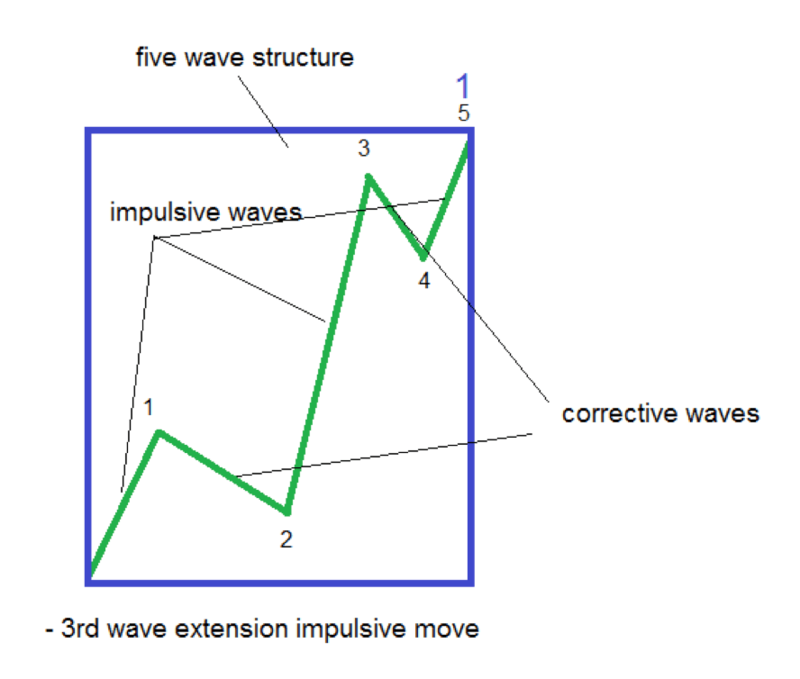 A bullish impulsive wave shows a five-wave structure that rises. Even within these five waves, two show corrective activity. They are corrective waves of a lower degree, and, together with the other three impulsive waves, form the five-wave structure Elliott discovered. But the market makes various moves. 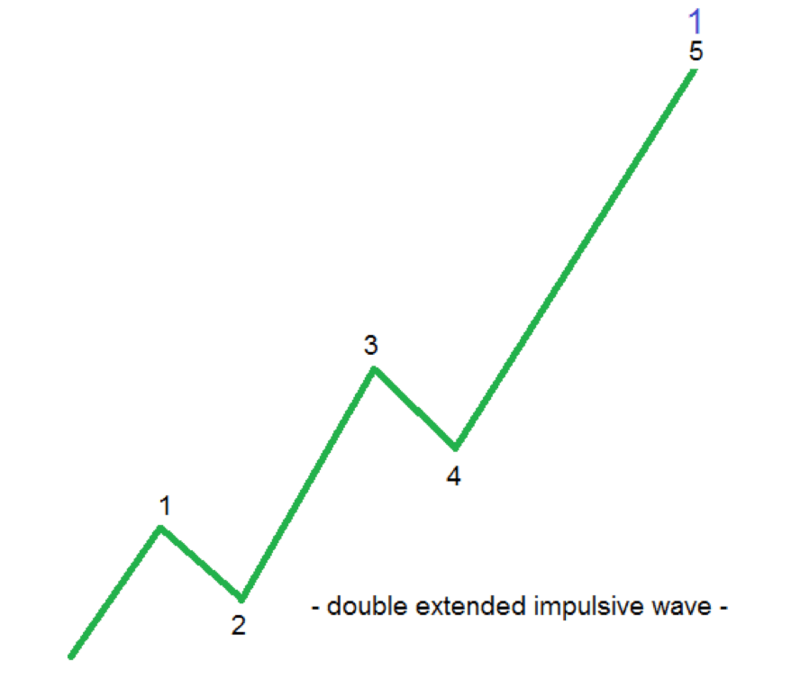 Traders struggle to distinguish between impulsive and corrective waves. That is because even some corrective waves have at least one impulsive wave of a lower degree. However, the aim of this article is to focus on impulsive waves. Everyone knows the third wave is the longest wave in the structure. But this is not the general rule and not the way the Forex market these days moves. As a rule of thumb, Elliott noticed that in any impulsive wave, at least on wave extends. This represents the so-called "litmus test". In plain English, one wave must be the longest. Or, it must stand out of the crowd. 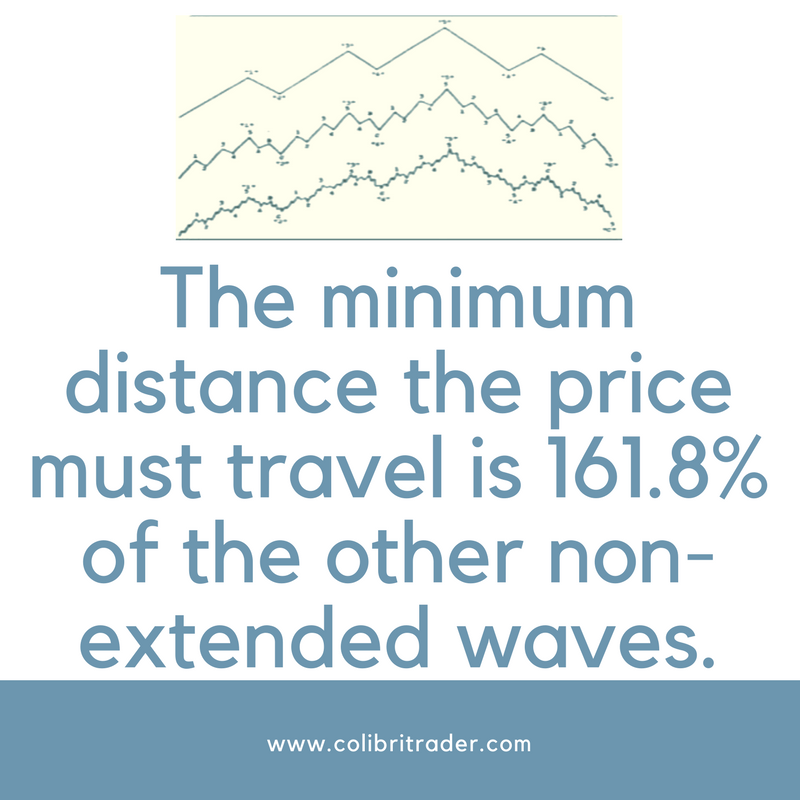 NOTE: In mathematical terms, the minimum distance the price must travel is 161.8% of the other non-extended waves. The key here is to understand that the extension refers only to the impulsive waves of a lower degree, within the impulsive wave of a bigger one. Namely, only to the 3rd, 1st and 5th waves in a five-wave structure. Out of these three possibilities, the 3rd wave is the most likely to extend. 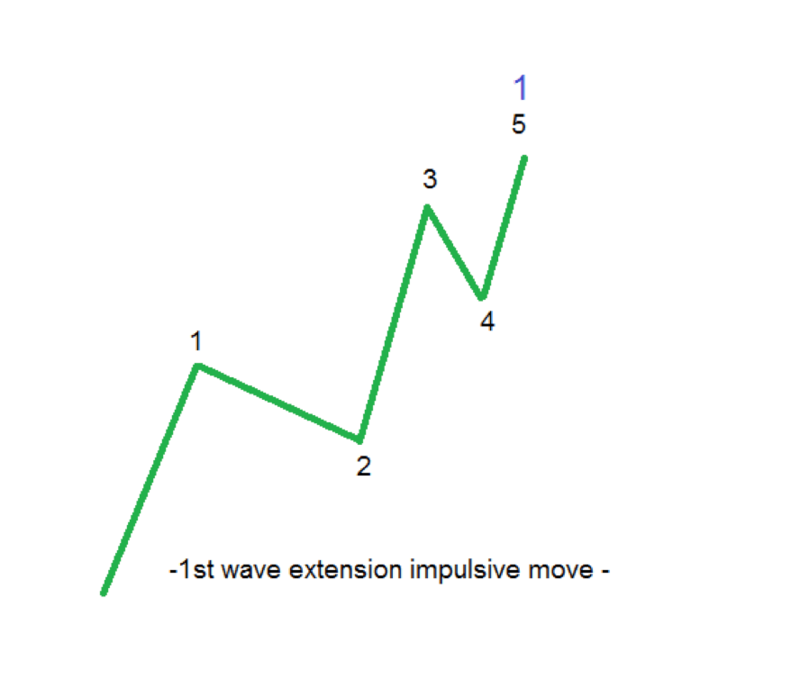 A 3rd wave extension impulsive wave forms most of the times. Few traders understand the true nature of an extended wave. Important: The 161.8% distance is the MINIMUM distance the price MUST travel. It can move way beyond that level. The Fibonacci Expansion tool. Click at the start of the 1st wave, at its end and at the end of the 2nd The projected 161.8% level shows the minimum target. The next possibility is for the price to form a 1st wave extension. These extended waves form often on today's Forex market. In such a structure, the 1st wave stands out of the crowd. It is bigger than the 3rd and the 5th waves. These two are the so-called non-extended waves. However, one of the most important Elliott rules states that the 3rd wave cannot be the shortest. Hence, we have the structure of this impulsive move. Usually, the 2nd wave is the most time-consuming in such a pattern. At the same time, the 5th wave is the shortest one both in time and in price. If you know how to trade with Elliott Waves, you know this is a rare possibility even in the Forex market. When a 5th wave extension forms, it can only be the c-wave in a flat pattern. In principle, it can appear in other places, but in reality, they only appear as part of a flat. Even in this case, traders will end up misinterpreting the move. The 5th wave is the biggest, the 3rd wave is not the shortest, and this makes the 1st wave the smallest one. For this reason, traders confuse this impulsive wave with a corrective one. Both conditions happen in the same five-wave structure. By the time the impulsive move ends, traders will scratch their heads not knowing what just happened. To the surprise of many, when it moves, the market mostly forms corrective waves. Not impulsive ones. However, within the corrective waves, there's plenty of impulsive activity. For example, in a zigzag, there are two impulsive waves. That makes a triple zigzag to have six different impulsive waves connected by little or no drawdown. What I'm trying to say is that when you see an impulsive wave forming, most likely it comes as part of a corrective wave. Yet, knowing the possibilities for the patterns to form, keeps you on the right side of the market.